HDMI 2.0, RS232, IR, USB 2.0, and Ethernet 10/100 are supported up to 1000 feet over a single Celerity Universal Fiber Optic Cable. 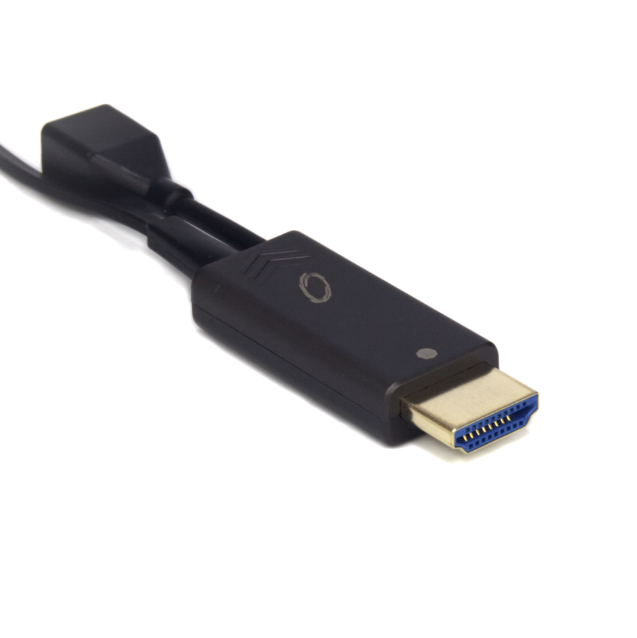 HDMI 2.0, RS232, IR, and Ethernet 10/100 are supported up to 1000 feet over a single Celerity Universal Fiber Optic Cable. Celerity Universal Fiber Optic Gateway is a breakthrough for distribution of AV and control signals over fiber optic cable. 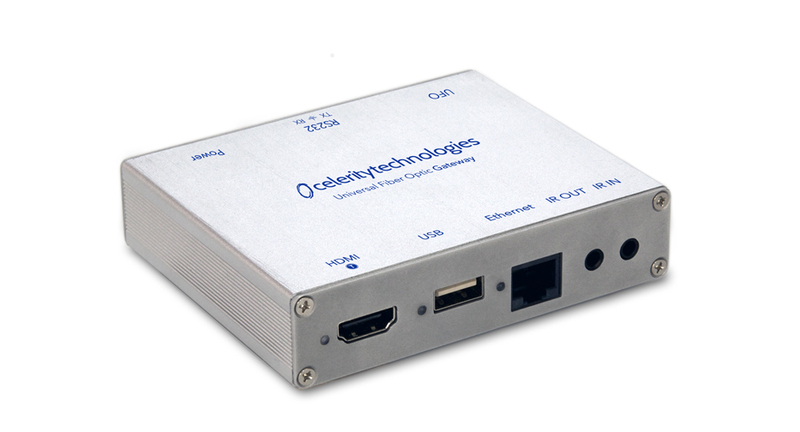 Supporting HDMI 2.0, 18 Gbps and up to 4:4:4 color, Celerity UFO Gateway delivers 100% pure signal integrity from point to point at exceptional speed. HDMI for high definition video and multi-channel audio; IR transmission for remote control; USB 2.0 for video camera and hard drive server; Ethernet to support Internet content or IP control to a smartTV or other network device, can be transmitted on a single Celerity universal fiber optic cable up to 1000 feet.between the Celerity UFO-G-TX and UFO-G-RX transmitter and receiver.Celerity UFO-Gateway is available in two versions - with and without USB 2.0 support. 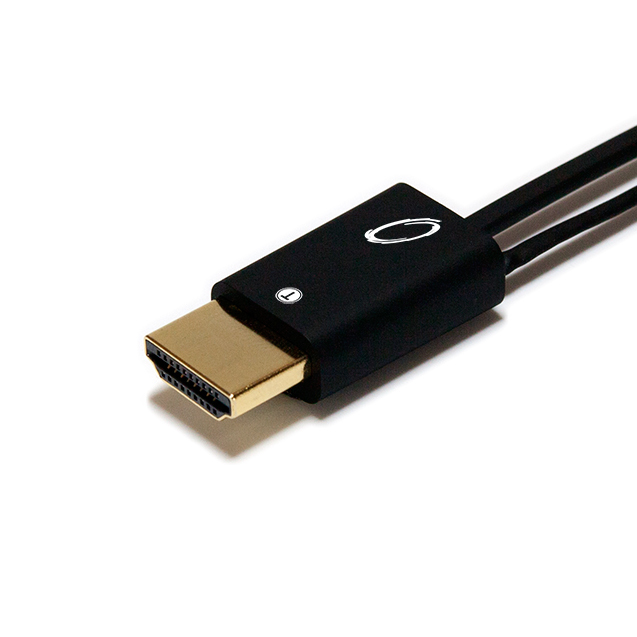 UFO-G-U models support USB 2.0 and are silver finish while the UFO-G do not support USB 2.0 and are a black finish. With Celerity UFO Gateway, only 2 steps are required – Pre-wire and Connect. This saves time and cost, and requires no tools. Using the MPO connector on each end of the Celerity Fiber Optic Cable, a secure snap-locking connection is made to the UFO-G-TX and UFO-G-RX. The Celerity UFO Cable is plenum-rated to meet required safety specifications and building codes. Celerity UFO Cables are sold separately. 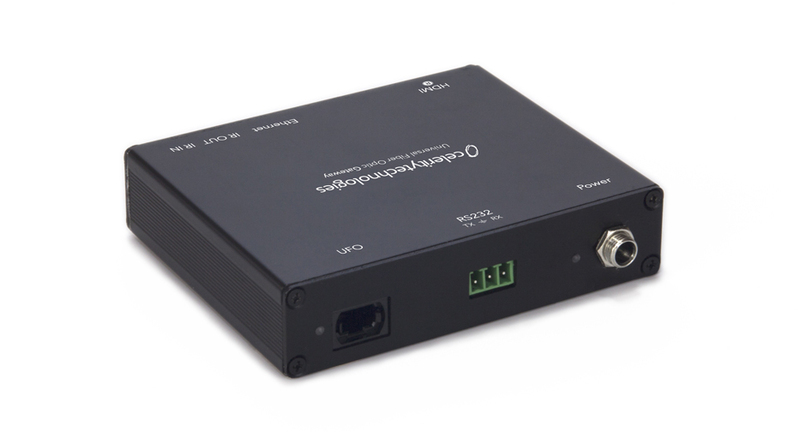 In addition to the easily pre-wired fiber optic cable, the Celerity Fiber Optic Universal Gateway has been engineered to assist installers in placing the control box wherever they need system control connections. Measuring a compact 4”x 3”x 1” (101mm x 83mm x 25mm) size, each Celerity Gateway control box includes a mounting bracket which is easily attached to the underside as needed, to provide mounting points for equipment racks, enclosures or on a wall. Want to know the what's new at Celerity? Send us your email and we'll send you the latest. HDMI 2.0, RS232, IR, USB 2.0 and Ethernet 10/100 are supported up to 1000 feet over a single plenum rated Celerity Universal Fiber Optic Cable. Designed with commercial systems applications in mind, UFO Gateway control box with USB 2.0 provides two-way control for KVM applications, and high resolution video camera link to a hard drive disk server. HDMI 2.0, RS232, IR and Ethernet 10/100 are supported up to 1000 feet over a single plenum rated Celerity Universal Fiber Optic Cable. Designed with residential system applications in mind, UFO Gateway control box does not include USB 2.0 functionality. 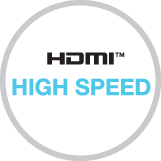 HDMI 2.0 supports up to 18Gbps performance including HDCP 2.2 and HDR when applicable. 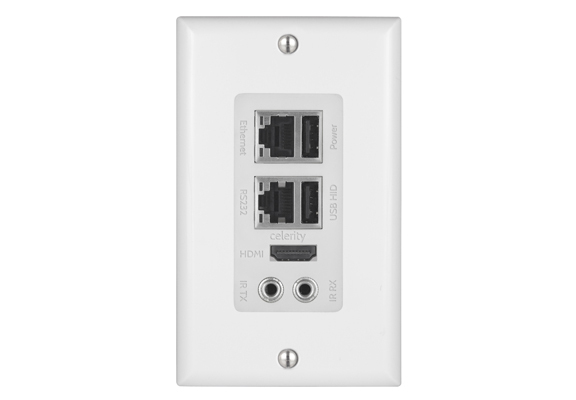 Providing the convenience of an architectural design for in-wall and recessed installations, the Celerity Fiber Optic Gateway Wall Plates have been designed to provide a small footprint, thin-depth fiber optic wall plate connection point. Suitable for in-wall mounting behind components, and located at in-room connection panels for classrooms, conference rooms and fixtures such as lecterns and table boxes, the Celerity FOG-TXWP and FOG-RXWP offer versatility for installation requirements. With a mounting depth of only 1.55" (40mm) and a single Celerity mini digital connector on the interior side, the FOG-WP may be installed efficiently and without the need for on-site fiber terminations. 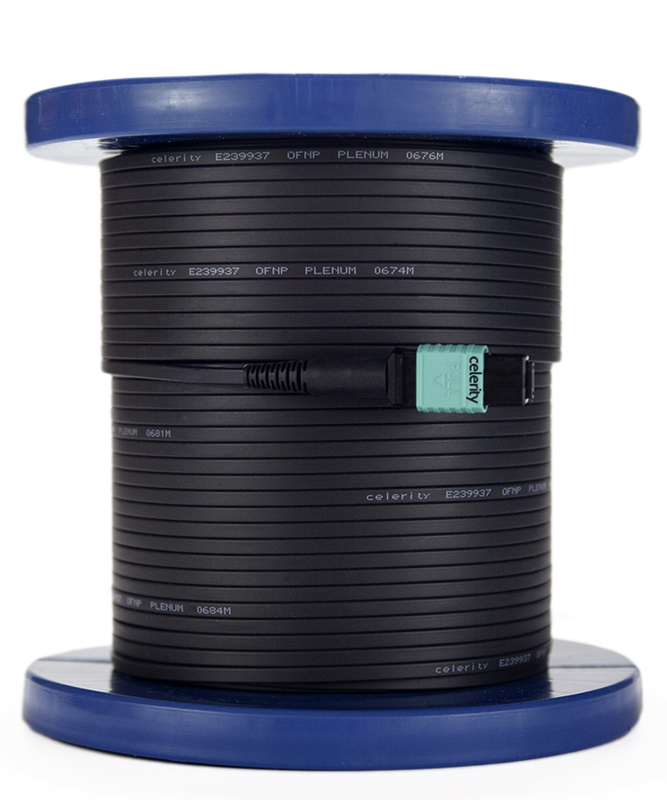 A Celerity Universal Fiber Optic Cable, available from 35' to 1000' securely connects to the Celerity Universal Fiber Optic Gateway Control Box transmitter and receiver. The snap-lock MPO connector at each end of the UFO cable securely locks to the transmitter and receiver’s port to provide an optical connection directly from cable to the device. 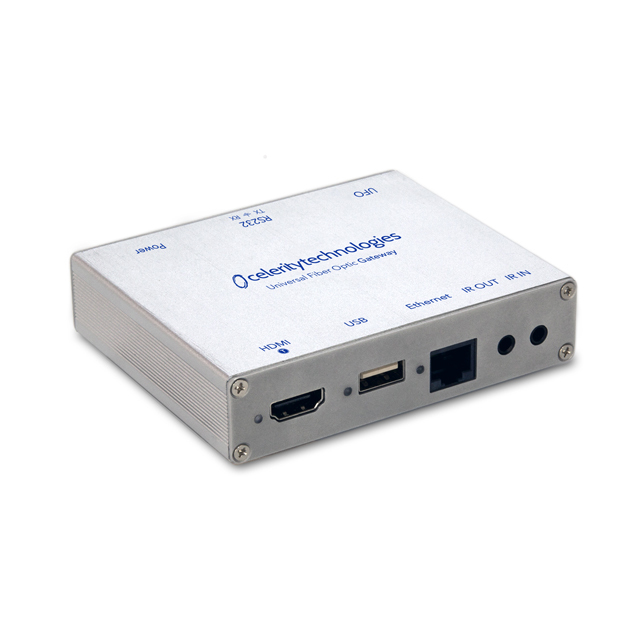 This direct optical interface ensures maximum signal transfer and for the signals being carried. A protective seal and cap protect the optical connector until it is time to make the connection between the cable and the transmitter and receiver. The Celerity Universal Fiber Optic Cable eliminates the time consuming and costly steps of fiber terminations. With Celerity UFO cable, only 2 steps are required – Prewire and Connect. The Celerity Universal Fiber Optic Cable is plenum-rated to meet required safety certifications and are available in lengths of 35' 40' 60' 80' 100’ 130' 160' 200' 500' and 1000'. Custom lengths may be special-ordered. Celerity Universal Fiber Optic Cables are sold separately from the UFO Gateway transmitters and receivers.